pasta | I Should Cocoa! Sometimes you just want comfort food. Sometimes, you unwittingly wander into an awesome indie music festival and end up spending the whole day laying in the grass listening to some of your favorite bands play music all day with your amazing friend Niti and by nightfall you realize you’re starving and you don’t want to eat any festival food because you both have a sudden and relentless craving for mac and cheese and only the kind from a blue box will do and so you leave the concert to drive to Kroger and pick up blue box mac and cheese and Heinz ketchup (no other brand is acceptable) and rush home and make a pot of it and eat it straight from the pot with a spoon while Niti’s then-fiance-now-husband watches with amusement because y’all are crazy. I mean, this happens sometimes and that is OK. Other times you have this exact same scenario occur but you also want to pretend that you have reached adulthood and this is a story of one those other times. 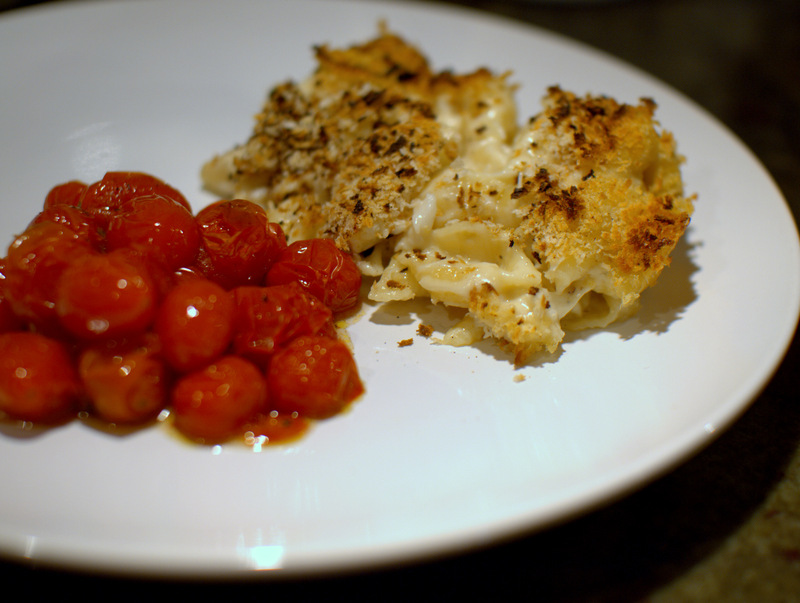 You can class up your plate of cheesy mac by splurging on some decadent crab and brie macaroni and cheese. I made a big dish of this recently to celebrate a weekend of No Plans Whatsoever and to have a great excuse to get Dungeness crab. Making a bechamel of brie is super easy and really, you can sub in camembert or any other soft cheese (goat cheese may be a great tangy alternative) that you like. I am always worried about over salting and was especially so in this case with the inherent saltiness of brie – however, even after adding some traditional Maryland Old Bay seasoning I found I needed to add more salt so make sure to salt to your taste. 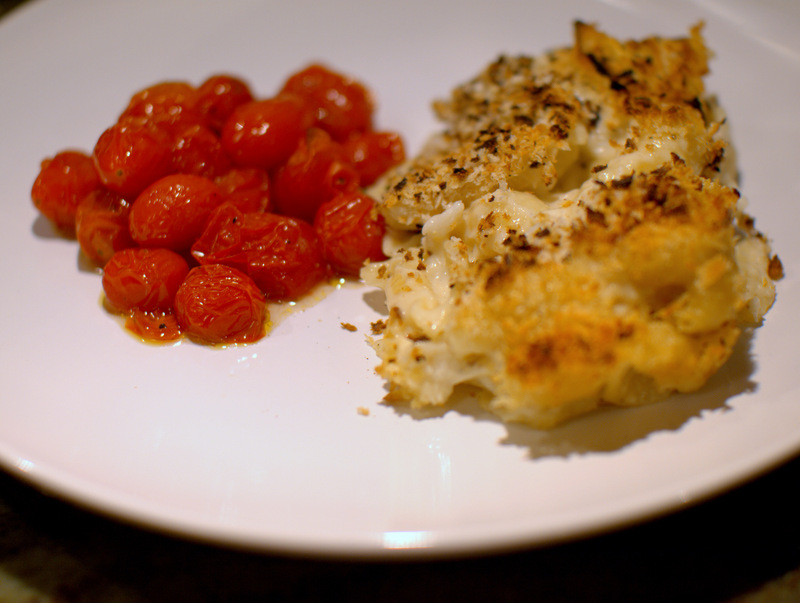 Also, I always use panko for that perfect bread crumb topping – its super light and crunchy. I further classed up this plate with some simple roasted tomatoes as a play on a side of ketchup. This makes OK out-of-season tomatoes great and wonderful height-of-summer tomatoes glorious. 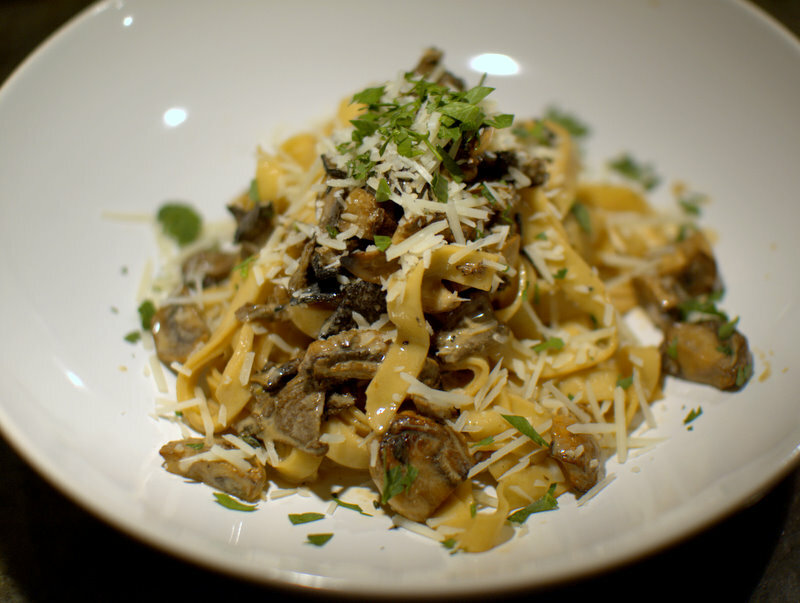 Their ripeness are the perfect acidic complement to the creamy richness of the pasta. 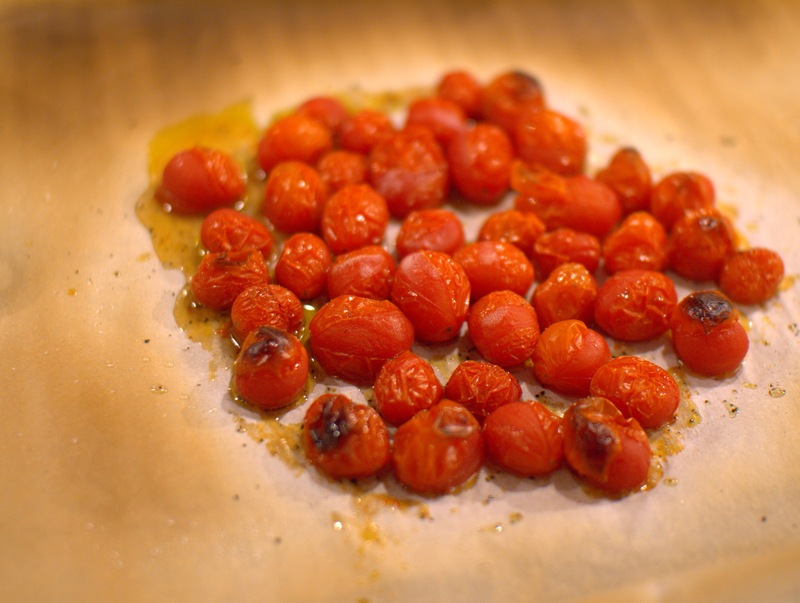 Simply drizzle cherry or grape tomatoes with a flavorful olive oil, add fresh ground salt and pepper and roast for 15 minutes in a 400 degree oven. Pour some of your favorite wine, light some candles, and revel in an elegant grown-up meal that satisfies your secret childhood comfort food cravings.